It's not every Sunday that the pastor walks into the sanctuary to be met by a life-size, cardboard boat. 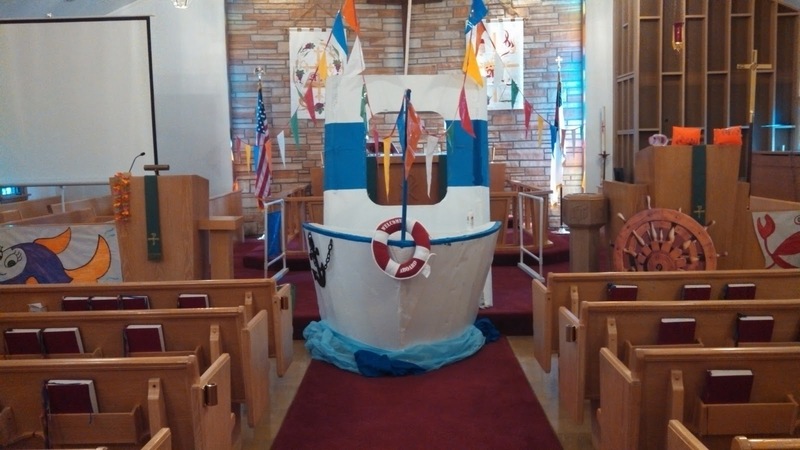 A life-size cardboard boat perfectly situated in the center of the sanctuary blocking any chance of anyone coming to the communion table. A life-size cardboard boat about to set sail for the upcoming week of Vacation Bible School. Of course I had been warned about the boat. A warning that included: "We'll have to be flexible with communion this morning, pastor." Upon entering the sanctuary, I could hear the gospel text laughing at me: "You are worried and distracted by many things." It was fitting that the gospel for the day told of Mary and Martha and the visit of Jesus to their home. There was Martha keeping busy, being distracted by the many things she needed to accomplish to offer hospitality to her guest. Jesus of all guests! Of course she was busy and distracted. And then there was her sister, Mary. Mary who sat at the feet of Jesus to listen. To be. To know that she is loved precisely because of whose she is, not what she does. So what about my distraction - a life-size cardboard boat in the sanctuary! Now, I love surprises. I love being reminded that worship is never about perfection or neatness or being well-planned. I love that God comes to us precisely in the midst of our distractions. So give me a boat any Sunday. Give me the reminders that Jesus breaks into our lives whether we're ready or not. Whether we think we're worthy or not. Whether we're distracted or not. So there we were, a community full of hope and excitement for the upcoming week. A community with lots of talent and creativity. And a large boat. And we gave thanks to God. We worshipped. We prayed. We sang. We broke bread. Thanks to the large, boat, the words of institution were offered in the aisle. I stood among the people, right in the midst of them. I looked to my left and to my right and saw God's people hungry for a word of grace. I lifted the bread and remembered Jesus on the night in which he was betrayed. I lifted the bread and knew that the breaking of the bread was for each of us gathered that morning. I lifted the wine and heard the words that each of our sins are forgiven. Right there in the center of our worship space, God broke into our lives and handed each of us strength for the journey, hope for the day, and grace beyond compare. One by one families and children and adults came forward to receive the bread. The body of Christ. Given for you. One by one families and children and adults came forward to drink the wine. The blood of Christ. Shed for you. We weren't at the rail receiving communion as usual, rather we were at the back of the sanctuary, surrounded by God's people and one large boat. I, for one, am glad for distractions, such as a boat, that force us out of our usual way of doing things and into the embrace of the One who has no boundaries. The reminder that just when we think we have this whole church and faith life figured out, God breaks in with a presence so powerful that we have no other response but to say, Amen.